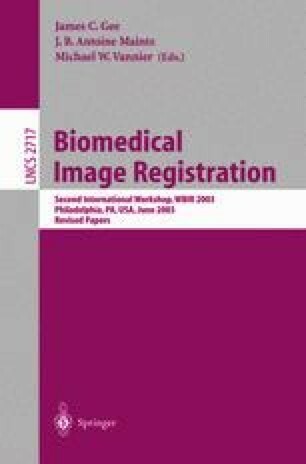 his manuscript tackles the registration of 2D biological images (histological sections or autoradiographs) to 2D images from the same or different modalities (e.g., histology or MRI). The process of acquiring these images typically induces composite transformations that can be modeled as a number of rigid or affine local transformations embedded in an elastic one. We propose a registration approach closely derived from this model. Given a pair of input images, we first compute a dense similarity field between them with a block matching algorithm. A hierarchical clustering algorithm then automatically partitions this field into a number of classes from which we extract independent pairs of sub-images. Finally, the pairs of sub-images are, independently, affinely registered and a hybrid affine/non-linear interpolation scheme is used to compose the output registered image. We investigate the behavior of our approach under a variety of conditions, and discuss examples using real biomedical images, including MRI, histology and cryosection data.